Watching “Horse Majeure,” there’s a definite feeling that something has changed in the wake of “The Telescope.” Obviously, there’s been seismic plot developments—BoJack’s selfishness and cowardice pulled into daylight, BoJack disastrously acting on his feelings for Diane—but even looking past those parts of it, the action of this episode feels much more original and more compelling than the first half of the season did. It’s as if the emotional weight of “The Telescope” pushed some cork loose, and now that BoJack Horseman knows what it’s capable of, it feels so much more assured in what it wants to do. That’s not to say things have taken a sharp right turn, as “Horse Majeure” doesn’t try to top the emotional weight of its predecessor. In many ways it’s steering in the opposite direction with some of the goofier jokes to date: Mr. Peanutbutter losing his drivers’ license because he can’t stop chasing the mail truck, Princess Carolyn going on a date with three boys stacked on top of each other under a trench coat, Character Actress Margo Martindale staging a phony bank heist. But while the silliness is sillier than ever, it’s operating with more awareness of the vein of melancholy running underneath it all, emotional breakthroughs or personal realizations drawn out of supposedly nonsensical situations. The action picks up immediately after the disastrous kiss at the end of “The Telescope,” which Diane responds to in the sanest way possible—babbling about the heat at Nantucket and getting out of the car in the middle of the highway. BoJack goes back into plotting mode, deciding that rather than make amends with Diane the best thing to do is to is to ruin her wedding. Once again BoJack’s using foodstuffs and an improvised map to plan a caper, only this time it’s no longer as simple or innocent as his prior misadventures. This is a legitimately bad thing he’s trying to do, and everyone around him knows that. Todd’s usual enthusiasm for his roommate’s plan is tempered at best, and Princess Carolyn dismisses his request and decides that she’s going to get a drink with the first man she meets in a bar. Or rather, the first three boys stacked on top of each other that she meets at a bar, in what may be the best joke of the series to date. 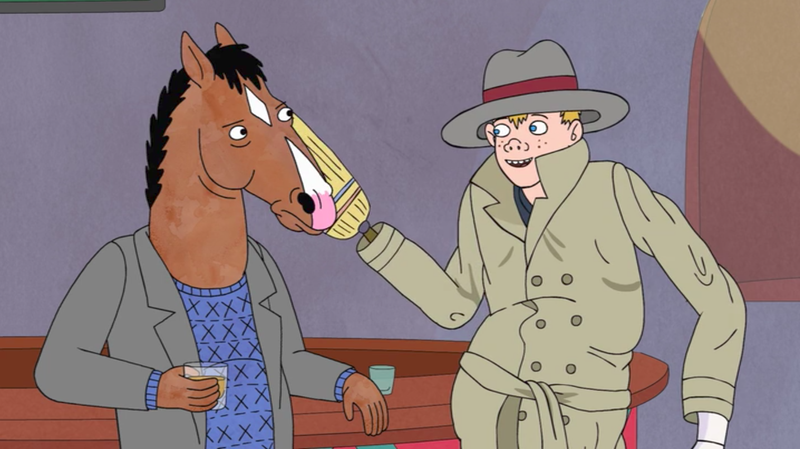 Vincent Adultman takes the old gag of the totem pole trench and turns it into something new, with everyone treating him as a real person and BoJack the only one who can see he’s not. Everything about the joke works, from the visual construction of Vincent and his mannequin/broom hands, Alison Brie’s high-pitched talk about “business transactions,” and the fact that no one other than BoJack entertains the idea he’s not a real person. And most importantly, it’s not that everyone’s doing it to deliberately mess with BoJack: this is a legitimate disconnect from reality that’s just happening to affect everyone except him. It’s only the first frustration that’s visited on BoJack over the week of “Horse Majeure,” as his various schemes to break them up all fall apart. Todd fails to infiltrate the Peanutbutter home successfully, and then gives BoJack little intelligence that doesn’t concern Smashmouth CDs or sticks. His recruitment of Character Actress Margo Martindale to stage a bank robbery is an ill-conceived venture that only succeeds in pushing up the wedding timetable. And then his eleventh hour planning is thwarted by a jury duty notice he ignored three days earlier. (A result that produces the best line of the episode: “Damn you, Tuesday BoJack!”) BoJack’s fully in the wrong here, and the BoJack Horseman universe seems to be conspiring to make sure he doesn’t get what he wants. By turning the audience on BoJack’s craven efforts to sabotage Diane and Mr. Peanutbutter’s wedding, it helps build more affection for the couple he’s trying to break apart. 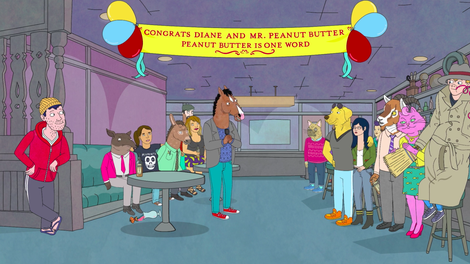 Mr. Peanutbutter completes his journey from one-note joke to full character this episode, as he calms down an increasingly distressed Diane with a mix of warm speeches about warm biscuits, and some details that the audience wasn’t privy to about his personal life. (He’s been married twice before, making him much less interested in an elaborate wedding.) He’s still as goofy as ever—witness the look in his eyes when that mail truck drives by, or his Coolio music video seating—but it’s a sincere goofiness rather than pure naïveté. And Diane gets a sweet moment out of those interactions too, an affectionate “Settle down, boy” when he gets worked up about the post office again. Mr. Peanutbutter’s relationship with Diane is in the best place it’s been this episode, and a new relationship opens up as Todd takes on the job of his personal driver. We got a taste of the two interacting back in “Zoës And Zeldas” with his enthusiastic reaction to Newtopia Rising: The Search For A New Utopia: Book One, and “Horse Majeure” fully commits to that potential. These are BoJack Horseman’s most directly funny characters, both with a similar joy for the possibilities of life and a willingness to move past its more problematic elements. Their first meeting is a terrific validation of the pairing, as Todd gratefully uses Mr. Peanutbutter’s resume as his own and still comes close to botching it (“I’m Roger Dangerfield!”). And then when things progress to full friendship, it introduces some new personal stakes for both: Mr. Peanutbutter shows his first signs of uncertainty by disclosing his doubts, and poor Todd is trapped between two warring loyalties with this bombshell information. That moment of awareness manages to eclipse BoJack’s own moment of awareness, when he admits to a prison-bound Character Actress Margo Martindale that he’s in love with Diane. For much of the series to date, the focus has been on BoJack’s ability to tear through Hollywoo doing his own thing, warring with his demons and the disapproval of others but still managing to come out on top or convincing himself that was what was happening. Todd stands up to BoJack for the first time and manages to get through to him in a way that not even Princess Carolyn or Diane could, convincing him that for once his feelings should be secondary to someone else’s. Standing outside Elefante, BoJack’s taking on a familiar posture: completely defeated. “Horse Majeure” ends with a new status quo for BoJack Horseman. Diane and Mr. Peanutbutter have tied the knot and have decided that their doubts are a lot less frightening if they approach them together. Princess Carolyn, if not in a healthy relationship, is at least in a relationship that isn’t BoJack. Todd’s now Mr. Peanutbutter’s right-hand man, and while he can’t control the waves he’s got business cards and plenty of opportunities. And BoJack didn’t get anything he wanted out of his plans, but he did get a few comforting broom scratches and some form of awareness that his problems aren’t the biggest things in the world. It’s an encouraging configuration of events, moving past some of the early conflicts as we get into the final third of the season. Achievement in Voice Acting: In her second appearance, character actress Margo Martindale truly becomes Character Actress Margo Martindale. Martindale dives gleefully into this exaggerated version of herself, speaking thoughtfully of her acting qualifications and then animatedly describing the fingers she’s going to bite off once she gets to prison. Glimpsed at the Peanutbutter/Nguyen wedding: Pinky Penguin, Neal McBeal, Jelly, an escaped member of the Latin Kings, a wolf in sheep’s clothing. VINCENT ADULTMAN!!! We’re almost two seasons removed from our last sighting of him, and Raphael Bob-Waksberg admitted that there’s not really a reason to bring him back, but damn it, he’s missed. The wedding is performed by Roxie, who’ll be introduced as one of Diane’s old ironic barista friends in “The BoJack Horseman Show” flashbacks. Tomorrow: We return to the grandest heist in Hollywoo history as “One Trick Pony” tries to dramatize the theft of the Hollywoo D.